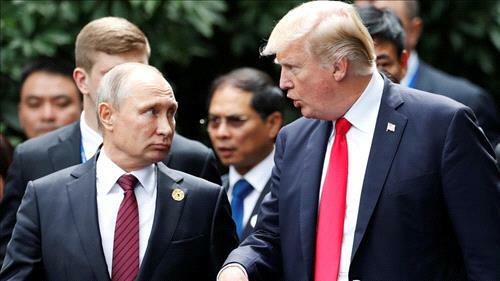 AMMONNEWS - US President Donald Trump and Russian leader Vladimir Putin agreed there was "no military solution" for the war in Syria, in a joint statement approved on the sidelines of the Asia-Pacific summit, the Kremlin said Saturday. "The presidents agreed that the conflict in Syria has no military solution," and confirmed their "determination to defeat ISIL", the Kremlin website said, using another acronym for ISIS. The two talked and shared a handshake at the summit in Vietnam's Danang after several days of uncertainty over whether a meeting would take place. "The presidents confirmed their commitment to Syria's sovereignty, independence, unity, territorial integrity and secular nature," and urged the warring sides to participate in UN-led peace talks in Geneva, the Kremlin said. The presidents' joint statement also "expressed satisfaction" with efforts to prevent incidents between their respective forces in Syria, "which allowed to considerably increase ISIL losses on the battlefield over the last few months." The Russian military has recently accused the United States of merely "pretending" to fight ISIS in Iraq and of hindering the Russian-backed offensive in eastern Syria. "The presidents discussed the necessity to reduce human suffering in Syria, and called on all UN member states to increase their contribution to help meet the humanitarian needs over the coming months," the statement said. Russia has been flying a bombing campaign in Syria since 2015 when it stepped in to support President Bashar al-Assad's rule and tipped the conflict in his favor.